Relax on board Whitsunday Blue as you sail through the beautiful Whitsunday Islands for the ultimate escape into paradise. With only 8 passengers and 2 crew, you will get to experience a very personal atmosphere with the best service. You will get to snorkel on the colourful fringing reefs of the Great Barrier Reef, wander the beautiful silica sand of Whitehaven Beach and enjoy some relaxing time back on board. Whitsunday Blue has stand-up paddleboards, plenty of deck space and a spacious interior to allow guests to feel completely at home while at sea. During the winter season of July to October guests may even be treated to a special sight, put on by the humpback whales who frequent the area, breaching and playing in the warm waters. 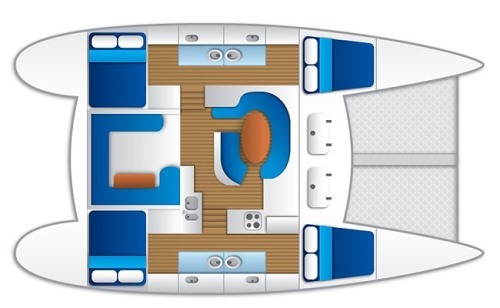 Whitsunday Blue is a very spacious vessel that has 4 private cabins all with ensuites bathrooms for the ultimate in guest comfort. The interior saloon seats all passengers for evening meals or you can dine under the stars on the aft-deck seating area. Please note three cabins have a private ensuite and one cabin shares an ensuite with the crew, with separate entrances. Blue was constructed in 2004 and is 40 feet in length with optimal space for her guests. Whitsunday Blue is designed to cater to the wishes of our guests, so you enjoy the ultimate holiday experience in the Whitsunday Islands. No two trips are the same as we take you from one idyllic island location to the next. 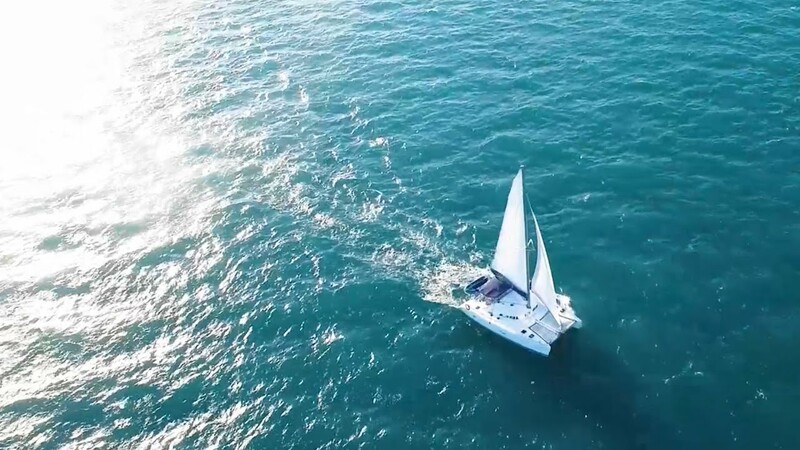 You won't be feeling blue on Whitsunday Blue but will feel a sense of adventure and thrill as you sail around the islands! The Whitsunday Islands are one of the top holiday destinations in the world and definitely one of the top sailing destinations. It is a sailing and boating paradise with calm waters and beautiful islands to explore, with quiet anchorages for overnight stays. Its beauty will leave you in awe as your crew takes you to some of the best places the Whitsundays has to offer to snorkel, swim, relax and explore. The seemingly endless bays and coves will allow you explore at length, with each stop more picturesque than the last. Sailing, swimming and snorkelling in the beautiful Great Barrier Reef Marine Park is just a normal day in the Whitsundays. Explore Australia's most stunning and unique national park and spot the local wildlife, wander the pristine white sands of Whitehaven Beach or take the walk to Hill inlet lookout - one of the photographed places in Australia! Whitehaven Beach attracts thousands of people to Australia every year who come to play and relax on the beautiful silica sands and swim in the calm shallow waters. As one of the most famous beaches in the world, it is the third most photographed place in Australia, where people try to capture a piece of its beauty to share with family and friends. Guided by your crew, you will take a short bushwalk up to Hill Inlet Lookout, where you will get to see the unforgettable view from above. The sands of Whitehaven Beach and Hill Inlet are never the same twice, with unique swirling patterns that will take your breath away. You will get to relax on Whitehaven Beach itself, enjoying the silica sands up close, keeping your eye out for stringrays and baby lemon sharks as they flit through the warm sunny waters around the beach. You can take time to sunbathe, swim, relax or walk along the soft sands, letting the surf take all your worries away. The Whitsunday Islands are home to some of the most colourful and diverse corals in the world. On board Whitsunday Blue you will get to experience the magic of this underwater paradise for yourself as you snorkel and swim in the protected bays and coves. Your crew will guide you to the best places and educate you on the local marine life to ensure you make the most of your snorkelling experience. This trip is ideal for both first time and experienced snorkellers with a qualified crew who are there to help you learn and have an amazing time in the water. Flotation devices are available to make your experience more enjoyable and more comfortable. Keep an eye out for clownfish, sea turtles, reef sharks and giant Maori Wrasse! Stand-up paddleboards allow for a great view of the surrounding area, a fun way to explore the reef and coastline, and gives you a work out at the same time! Great for spotting turtles and other marine life, stand-up paddleboards are becoming popular all over the world. Guests are welcome to take Blue's paddleboards for a spin around the boat or reef, enjoying the view as they make their way around. We guarantee the quality of our food on board Whitsunday Blue and we promise you won't be disappointed. Fresh fruit, cookies, tea and coffee are always available to guests during your trip. All dietary requirements are catered for and we are happy to help with special occasions, such as birthdays and anniversaries. This fun activity is great for as a solo activity or for two people to enjoy together. 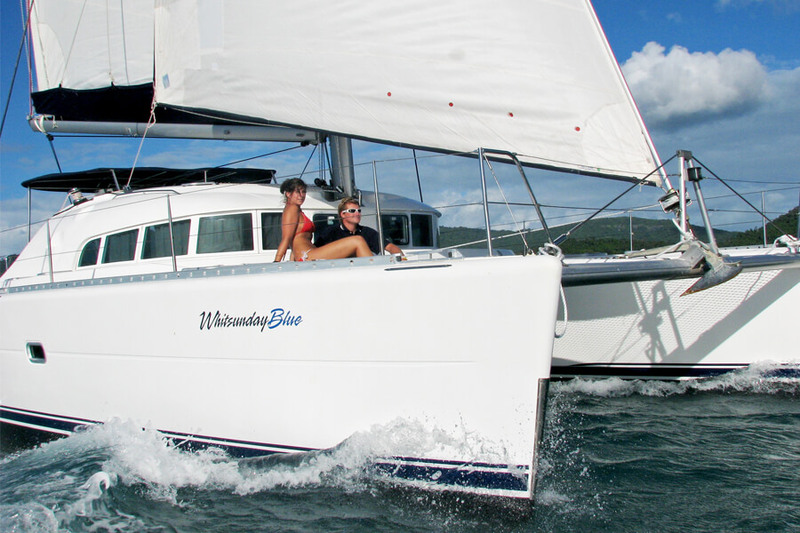 Whitsunday Blue 2D/2N is also available for Private Charter. "Fantastic crew, good food, great time." "Friendly relaxed vibe, good mix of activities!" "We had a fabulous time and our 2 days on Whitsunday Blue were a highlight of our travels. Aaron and Rachel are a great team, we were very well looked after. Aaron picked the best places for overnights and snorkelling, we saw hundreds of fish and some pretty good coral too. Rachel kept us really well fed with snacks, canapes, tasty lunches and dinners. We will definitely recommend you to anyone coming this way who wants an amazing trip in the Whitsundays." "So much fun had on this catamaran! Our captain Aaron not only knows his way extensively around this boat, with an exciting sail home today, but he also does a mean BBQ!! Scotch fillet steaks cooked to perfection! The cabins are spacious and it's just lovely to be gently rocked to sleep, with the ceiling hatch open and fresh sea air! We highly recommend this trip, perfect for couples in their 30s/40s. Thank you!" "Thank you very much for a great 2 days. We've enjoyed it very much - thank you for the lovely food!" "Crew was fantastic, informative, helpful, friendly and hard working!" "Amazing place, great food and company! Loved it!" "This has to be one of the most enjoyable things we have ever experienced. Never sailed before and somewhat apprehensive however these anxieties soon alleviated once stepping onto Whitsunday Blue and the feeling of being in safe hands by our crew. These 2 crew were hard working, very knowledgeable and so friendly. Couldn't do enough for you. A very enjoyable trip, would do it again in a flash, so relaxing; fairly extravagant but absolutely, well and truly worth every cent." "My Girlfriend and I were looking for a quiet 2 night sailing trip around the Whitsunday Islands and Whitsunday Blue fulfilled all our needs. Although a little pricier than other boats it was money well spent! Normally 8 people (we were lucky enough to have six) en suite rooms, and an abundance of quality food. I was never hungry, little touches like food on the table waiting as you come back from a snorkel. A trip to Whitehaven beach for a couple of hours to relax and enjoy this amazing beach and search for Rays and Sharks (found both!) And three quality Snorkel sites (a huge amount of marine life to view including turtles). All this along with some amazing views helped to make this trip one of the best on our holiday to Australia." "It was so lovely and such a pleasure on this boat. We were able to visit the wonderful beach and trail." "Had a great trip! We got to see turtles, so it was an all around success. The crew were brilliant." "Absolutely amazing trip! Fabulous crew - I loved it. Thanks a lot!" "The trip was amazing, we visited many beautiful places. I hadn't snorkelled before but I felt completely comfortable under the water under the guidance of the crew and loved it. The boat was beautiful and well looked after. We visited Black Island and were surprised with canapes and sparkling wine! The food was amazing and some of the best we have eaten in Australia!" "Everything we expected and more! The trip gave us a better appreciation of the Whitsundays. Very informative, friendly and efficient crew." "Outstanding - filled every expectation!" "We really enjoy this tour! The crew were so helpful and knowledgeable. Such a beautiful place!" "Once in a lifetime experience and an amazing way to see a beautiful part of the world. Crew was excellent, friendly and knowledgeable, nothing was too much trouble!" "We really enjoyed our sail! The crew were fab - very informative and great fun!" "It was a great tour with an awesome crew. The spots we had for snorkelling were very beautiful. The food was so delicious and the tour to the Whitsundays was so awesome!" "Amazing trip. Aaron has extreme knowledge of everything and Rihannon worked hard and looked after us. Brilliant experience thanks to the two of them!" "Excellent tour! Packed so much in two days and quality of tour was excellent. It was lots of fun and we didnt want it to end!" "The crews knowledge was excellent and gave me an appreciation of the entire ecosystem. The host Charlotte also did a great job and was very friendly." "The crew were excellent. The skipper was very informative and answered any questions we had. Were very friendly and helpful. Would definitely recommend this trip to others." "Aaron and Ali are very professional and knowledgeable, friendly and easygoing. There are always ready to help and share their knowledge. They were patient and made the trip a wonderful experience." "I would like to acknowledge the crews hard work in providing high-level of enjoyment for us all. All crew were really helpful and friendly. Food was great! " "By far the most exciting experience weve had. The pure joy of sailing was exhilarating. With ensuite facilities and only having a small group onboard made this trip a winner. Thanks so much to the amazing crew and looked after us." "It was lovely! an experience of a lifetime and weve been so well looked after. Wed recommend!" "Great trip! The service was great and the staff was very knowledgeable. Delicious food! I liked how the staff gave us personal insight about the islands." "Staff were accommodating, thoughtful and informative and gave us the experience of a lifetime. Even though the crew have done this so many times, they were enthusiastic and fresh in their approach. Safety was always considered. The diversity of the experience was appreciated." "Fantastic trip. Crew were very knowledgeable and friendly. Boat was great and the stops on our tour were brilliant. Thoroughly recommend. " "Great first mate! hated the march flies. Thanks for organising the dolphins." "Crew: Very friendly, entertaining and good with information about the islands, creatures and cultures. Food: Amazing, good variety, lots of it! Boat: Outstanding! Had everything to make the trip enjoyable." "Great fun time. Everything well organised, boat great and food better. Glen and charlotte did amazing job, looked after us unbelievably and showed us the island and top spots." Very informative, safe, skill and confidence of crew was evident, respectful of everyone needs, flexible. Cannot say enough.. a great experience. " "We loved the trip and accommodations, food, crew, beautiful areas visited. Very accommodating of glutton allergy. Crew very knowledgeable and helpful, a real delight. Wish we could have booked 3 nights or started earlier in the day. Would have liked more time to lounge on boat." "Crew - Very competent, safe, friendly, knowledgeable, relaxed, get in charge, wonderful! Food - Couldn't believe what came out of such a small kitchen - very impressed Boat - Very comfortable. Great treat to have private cabin + adjoining bathroom. Highlight of the trip was the sunset at the deck." "The Crew - 5/5 Very experienced and professional, great local knowledge added to the experience, very kind, friendly and hospitable. The Food - 5/5 Fantastic and plentiful! Highlight - Whitehaven and overall sailing." "The Crew - 5/5 Both are top level at making us feel comfortable and safe, informing us about the sea and islands and history. They took great care of us and we laughed so much. The Food - 5/5 The vegetarian food was the best Ive had on an extended trip and comparable to the best Ive had. Tom says excellent. The Boat - We loved this boat, and even though we have little sailing experience we know its up there with the best! Wed prefer to stay on-board longer! "The crew - 5/5 Friendly, very competent and informative. The food - 5/5 Good and plentiful. The food - 5/5 Ria is a wonderful cook, and we were really impressed especially regarding the poor conditions of cooking on a boat. The meals were healthy, divine and always well dressed. Aaron is a BBQ master. The boat - 5/5 The boat was spacious and well equipped. The food - 5/5 Food was plentiful and excellent. The boat - 5/5 Boat was very comfortable. we never felt crowded. Highlight - swimming with turtles!" "The crew - 5/5 Loved the stories and felt very safe in Jason's company. Great fun host. The food - 5/5 Really well organised, good timings, never went hungry and when the meals arrived they were very tasty. The boat - 4/5 Outside space was amazing, inside the rooms were very cosy and clean. "Ali and Jase were amazing. They made us feel so comfortable especially me as I nervous on boats. Jase was so informative so I felt I learnt a lot too. I loved all the food , there was plenty and was varied. Spacious . Nice common areas. Not too bumpy. " "The crew - 5/5 Crew was excellent! Despite the weather crew stayed very positive a, fun and optimistic, Crew created a fantastic route and activities. Felt like a local way to see the islands. Loved all the unique spots we saw and stories about each location. Highlight - Whitehaven beach and Cid harbour." "The crew - 4/5 Very friendly and provide great insight in their commentary for the trip. The food - 4/5 Food at regular intervals and nice selection. Very attentive service too! The boat - 4/5 Great deck space. dining outside was also really good. Blue lights at night great!! "The crew - 5/5 Jayce was so knowledgeable and shared lots with us - this was great. Lucy was so professional and fun. We felt very at home. The food - 4/5 Salads were amazing and dinner first night was awesome. The boat - 5/5 loved it and having private space was brilliant. Atmosphere was chilled an fun! "The crew - great knowledge of the area and even changed snorkelling location to poor visibility at first site. Ali was so accommodating. She definitely fulfils her role as mum on-board! (in a good way!) The food - Heaps of great food - we were lucky we didn't sink. Great fresh salads and main meals plus plenty of snacks and pre dinner treats. The boat - Looks newer than it is apparently! Great layout and amenities. Nice to lounge on the front trampoline especially with a bot of shade from the front sail. " "The crew - friendly & helpful. The food - delicious & lots of it The boat - nice & comfortable. A memorable trip"
"CREW: Superb hosts - v relaxed and friendly. Informative. Great fun. FOOD: All very nice, very thoughtful about food issues, very well cooked and prepared. BOAT: Highlight of the whole holiday. Don't want o get off. Great other guests. HIGHLIGHT: Difficult to separate all the good things being on the boat. " "The crew - very nice, professional and welcoming. The food - very good and healty - "
"Crew were really friendly and professional. Really forthcoming and helpful in everyway. Thanks for a great few days. Really enjoyed the variety and taste of the food, who know boat food can be this good. Well done! Very enjoyable, easy to get around and spacious for the 8 people on-board. Maybe get some cushions for the trampolines? F-A-B-U-L-O-U-S! " "Loved all the stories about the places we saw, the aboriginal cave, the corals and snorkelling. Good was great. Highlight of trip. - snorkelling and Whitehaven beach and dolphins! It was amazing thanks for everything!" "Aaron was friendly, very knowledgeable and we felt very safe with him. Ria was a superb hostess, friendly and excellent cook. Excellent food, plenty of it, beautifully cooked and good variety. " "crew were fantastic, happy and positive attitude. We couldn't have felt more looked after and safe in there knowledgeable hands. Food was delicious and v impressed with what Ali managed to produce every meal and snack. A brilliant sailing trip , unforgettable and we felt very looked after." "Friendly and knowledgeable crew who made you feel comfortable and safe at all times. Way to much food and delicious. Great boat With just the right amount of people to enjoy it. " "Crew made trip the trip! very knowledgeable, friendly, laid back - especially enjoyed the sing song fri night! Food very tasty and lots of it. boat very comfortable. " "The crew are the best!!! Vickey is a great cook!! Food was great"
"The crew was fantastically welcoming & helpful. The food was amazing & s much of - it was amazing seeing Vicky preparing & serving in such a small space. The boat got everything you could need it such a compact space - very comfortable. Keep doing what you're doing guys - Just great !!" "Both captain & host were amazing, very friendly, competent & lots of fun. The food was fabulous. OMG I do not eat that much at home :) "
"We always felt safe & well looked after! Daily activities well planned. Vicky procided edicous meals and snacks - presented well & timely. " "Brilliant crew, Very friendly and efficient. We choose this trip because of the great trip advisor reviews and it exceeded all of our expectations. Beautiful boat and excellent all round. " "Excellent skipper and hostess they could not do enough for us. Pointing out things of interest made us feel most welcome"
"It was just perfect, just like home"
"very friendly and helpful Thank you! We had a lot of food, plenty of it and I enjoyed it. " "The crew were very hospitable, friendly and knowledgeable about the area. Plenty of good food and snacks, we appreciated all the fruits and salads. Whitsunday Blue is a well cared for clean boat which met our needs perfectly. Over all it was a very relaxing experience "
"The crew on board Whitsunday blue were really friendly, viki fed us really well and aaron showed us the best spots for snorkeling . I want to complain because after this trip i will always be hungry in my backpacker life the food was really good!Whitsunday Blue was beautiful and comfy! enough space, good equipment for snorkeling kayaking and paddle boarding. Awesome view, snorkeling, staff and food!" "Nothing was too much trouble for Jayme our host. Aaron was a mine of information and has a great sense of humor. great team. If anything there was too much food! all lovely quality and nicely presented. Food Hygiene excellent. Lovely cabin, plenty of room! Relaxed, fun and felt thoroughly spoiled. " "brilliant Crew, very friendly and efficient. love the captains briefings he kept us well informed all the time. He gave me the confidence to snorkel properly for the first time. Big thank you to Aaron and Vicki. The food was amazing! never seen so much food!!! beautifully prepared by Vicki. Really appreciated fresh fruit and great steaks! One of the best experiences we have ever had if we return to the Whitsundays we would do it again! " "The Crew were great loved to hear all the storied and they are both extremely friendly and helpful. Loved the BBQ you certainly don't get hungry on this trip! Great way to experience the Whitsundays!" "Nothing was to much trouble, Skipper Aaron was as a mine of information and had a great sense of Aussie humour. All food was of lovely quality and nicely presented"
"Brilliant crew, Very friendly and efficent. Loved Aarons briefings , gave me and sue the confidence to snorkel properly for the first time. We choose this trip because of the great trip advisor reviews." "John our captain was excellent ans his knowledge of the area was very helpful. Vicky was an excellent host and she was friendly and helpful. She is excellent. Food was great and plentiful"
"Very good knowledge of the area and service and attitude was excellent. there was plenty of food all of which was excellent boat was very nice with a great net out front to lie on. " "Very friendly and knowledgeable answered all our questions nice variety and amount of food Perfect honeymoon trip! " "They are friendly and always there attitude was of good value. Please keep up the great work you have been doing. The food was nice and a good variety. Cosy boat with all privacy needed AWESOME"
"Very friendly they answered all our questions patiently and competently. Food and meals were very nice and tasty , varied a lot, nice idea the picnic at sunset. Clean and enough space and privacy Great Value and impressive. " "Both nick and Vicky were fantastic. very impressed with nicks knowledge and vickys cooking. Soooooo much food! good variation and thank you for providing lactose free milk. Fantastic - not long enough!! " "Aaron was very knowledgable and friendly. Always focused on making sure the passengers were having a good time. Aimee and Jayme again very friendly , polite, chatty , hard working and nothing was ever too much trouble. Excellent Crew. Always fresh food which was delicious. Plenty of variety and hosts always prepared to prepare dishes the way passengers wished. Never went hungry. Very clean, well looked after and modern boat. Comfortable and kept cool in hot temperatures. Trip of a lifetime which we did not want to end! I don't think words can sum up how amazing the 3 days were. " "The crew were knowledgeable friendly and over all a great team. Everything was delicious and plentiful. Great experience and friendly staff"
"The crew (Aaron and Viki) were great helpful, informative and very friendly. Great food - a lot better than expected and beautifully presented. Greta experience - the crew made the trip for us, helpful, friendly and safety conscious "
"Very friendly and brilliant hospitality. Always told us the best places to snorkel. Food was amazing so much variety and very filling. Boat was very clean tidy and spacious. AMAZING"
"Experienced and friendly captain flexible but always our safety as forefront, hostess nothing too much to ask always ready to help us. Excellent range for the weather conditions and the food always seemed to come just before we were hungry. Ideal for 4 couples enough privacy but always felt safe on board A great experience marvelous to just relax in such beautiful places. " "Both very friendly and welcoming. both good fun and knowledgeable. Nicole was a great cook with limited facilities. " "Nick and nicole made us feel very welcomed, they informed us about the whitsundays with their knowledge that they have - they are fantastic. i was amazed how nicole could come out with such tasty and amazing food from not a large kitchen. she did such a great job we never went hungry. Very clean and we all enjoyed our space, loved the sailing on the first few days as it was very windy - slept very well and enjoyed our journey through out the whitsundays." "Nick and Nicole were just special. Service was A+ personality- laughter - knowledge - nothing was impossible, I'm a bit left of center and they made me feel like the center of the universe yew! As a vegetarian i was so looked after with delicious meals every time. FAB! Donny loved all the cakes too! Very spacious and comfortable + clean. Love the nets on the bow. AMAZING such a great variety of activities and fun staff I didn't want to get off"
"Willo and Rachel have been amazing. Beautiful food, great company. Willo even let me drive which is suprising seeing as we sank the kayak! Loved them both The food was beautiful rachel is an excellent cook now i just have to lose the weight ive gained on board. Beautiful boat with lovely cabins. 2 of the best days ive had in my life!" "The whole experience was fantastic I cannot fault the captian (willo) or the host (rachel) Th food was excellent and well presented. Whitsunday Blue was the best! " "The crew were amazing - so friendly and courteous. the trip was well organized and the crew professional. There was always perfect and tasty food and just at the right time.Over all the boat was fantastic and the beds comfortable and spacious. We had a fantastic trip. Great Company"
"Very informative captain, good humored. excellent service by Vikki the hostess. Excellent food and plenty of it. Very good lay out - easy to get around and ideal for guests. "